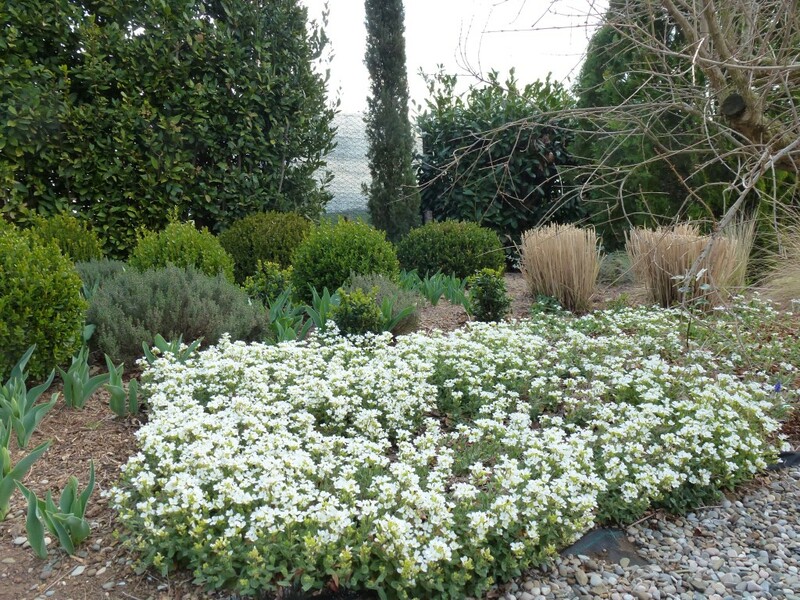 A month ago the garden was emerging from the snow and I was happy to report temperatures rising to 10° C. Now that we are officially in spring the temperatures are rising to just on 20° C – that’s a rise of 10° in one month! I have been away from the garden for a few days and on my return was amazed to see so much difference! 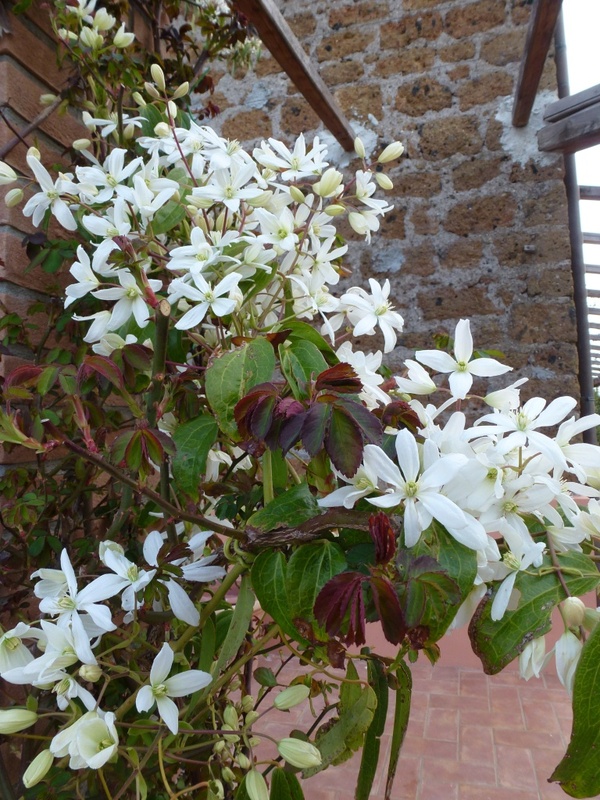 Clematis Armandii had two flowers open last Wednesday, today it is covered in flowers, spreading their honey, scent in the warm air. Many more Muscari are attracting bees and other pollinators and reassuringly flowering even in their congested clumps. But I’m not here to write about flowers, this is GBFD after all! Before I left Rosa mutabilis was looking a little bare; I’d pruned after the snow and in doing so had cut away a lot of the stems still carrying leaves revealing bare stems! 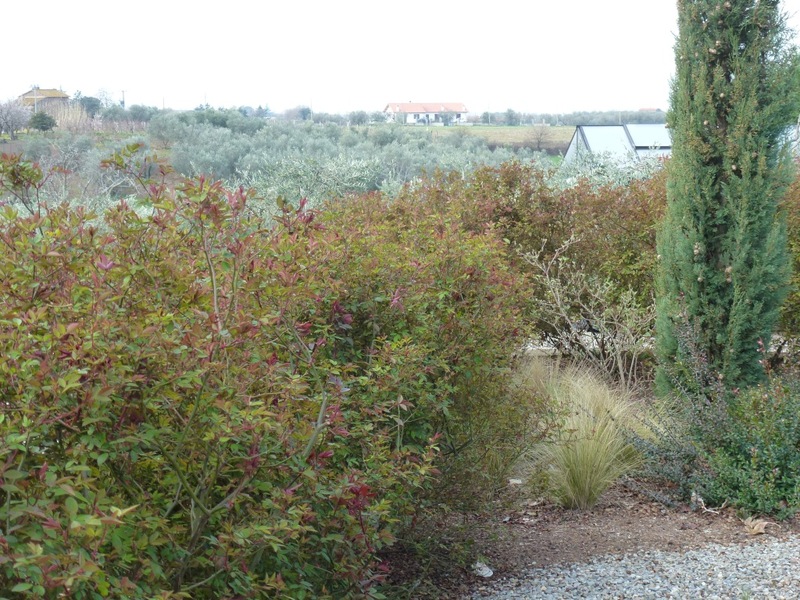 Today when I looked out of the window all the bushes were covered in new foliage making the bushes look very impressive. I may have pruned some of the emerging flower buds (last year there were flowers during March) but it will be worth it to maintain the full bushy shape. 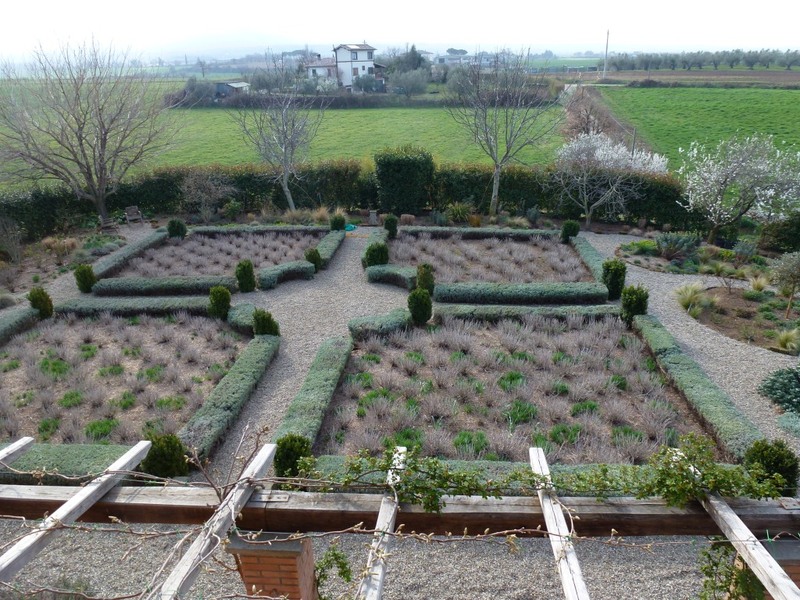 The Lavender hedges have been pruned and look very sharp! I love how they look at this point, they grow so fast here that I think they would benefit from being pruned 3 times a year, sometimes I only manage once; the clippings make excellent mulch as the leaves contain a chemical which inhibits the growth of seedlings hopefully including weed seeds! Having only just cut down last year’s dead foliage it is wonderful to see all the new growth. 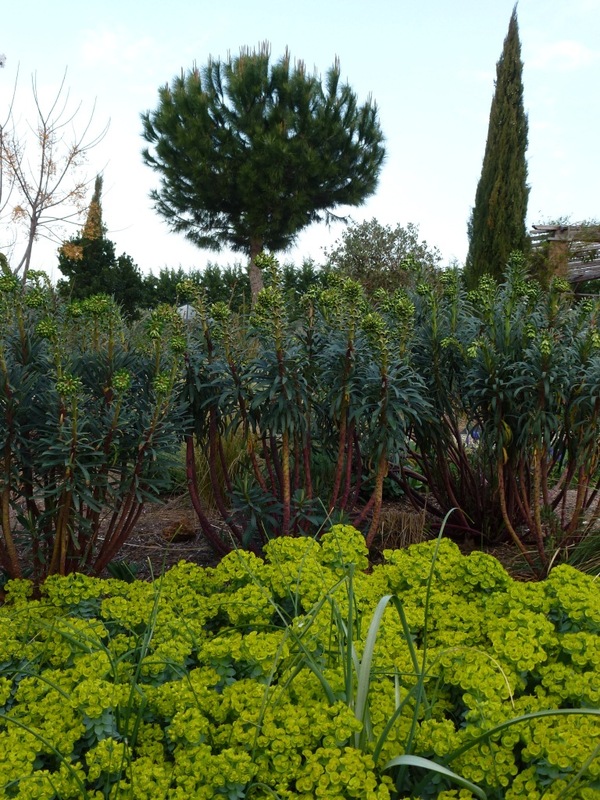 Euphorbia in its various varieties is the star of the show at the moment, either its foliage or vibrant bracts. 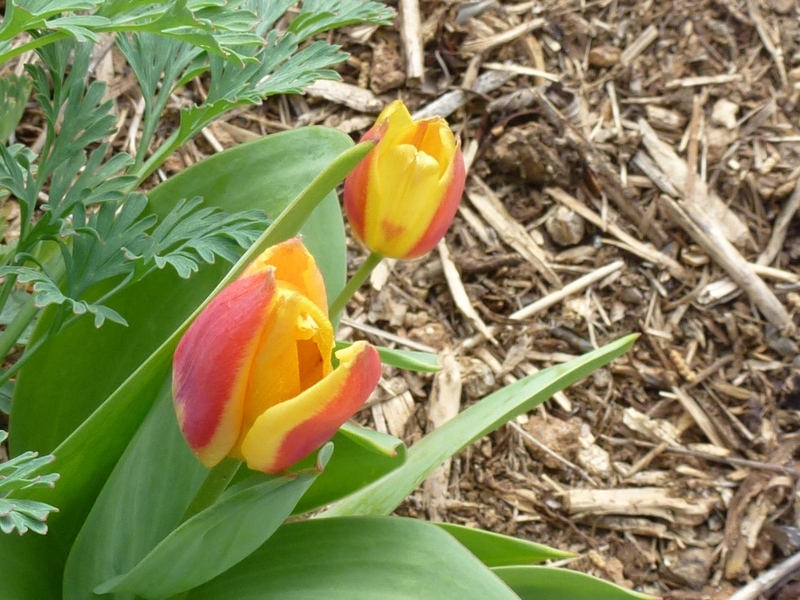 Through all the new ground cover foliage a large number of tulips are pushing up, this is gratifying as none were planted new in autumn 2011 so all are from previous years. 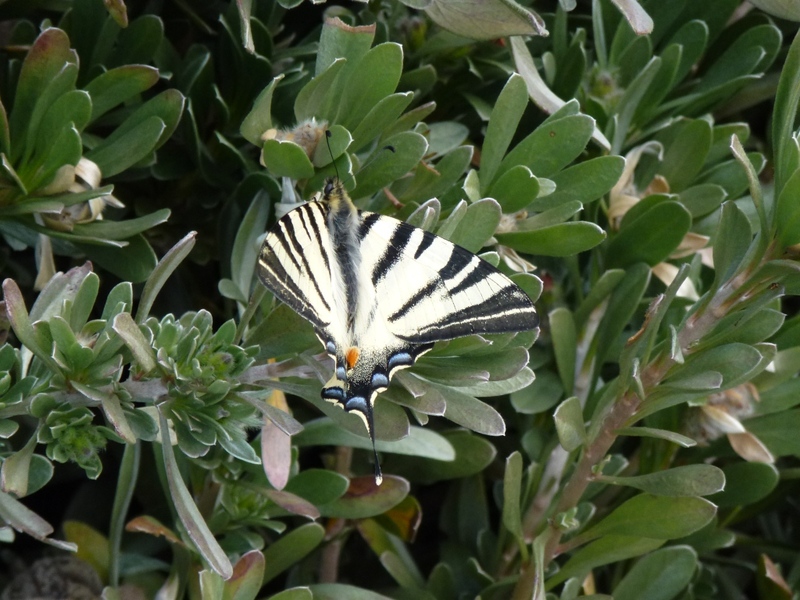 I can’t resist sharing this Swallowtail butterfly drying its wings in the sun after emerging from its chrysalis. 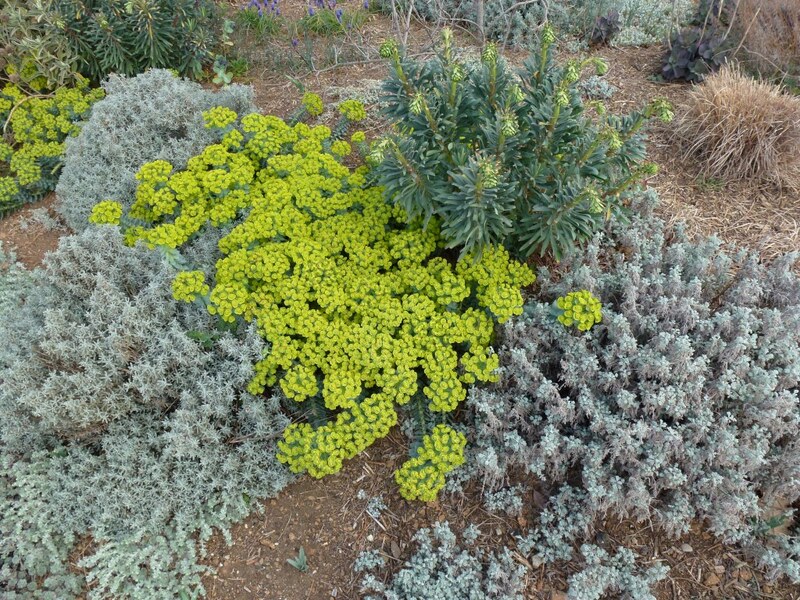 What foliage is taking the starring role in your garden this spring? It might be a foliage plant that has been giving good structure all through the winter or the newly emerging leaves of a plant you grow primarily for its flowers, I look forward to seeing and reading about your gardens now spring (or of course autumn in the southern hemisphere) is here. Don’t forget GBFD on the 22nd March. If you’ve posted under any other foliage meme you are still very welcome to join in here too. I’m looking forward to seeing some beautiful foliage now that it is spring/autumn depending what hemesphere you’re in! I am late this month posting. The images were taken on the 14th but I’ve not had time to write anything until now. 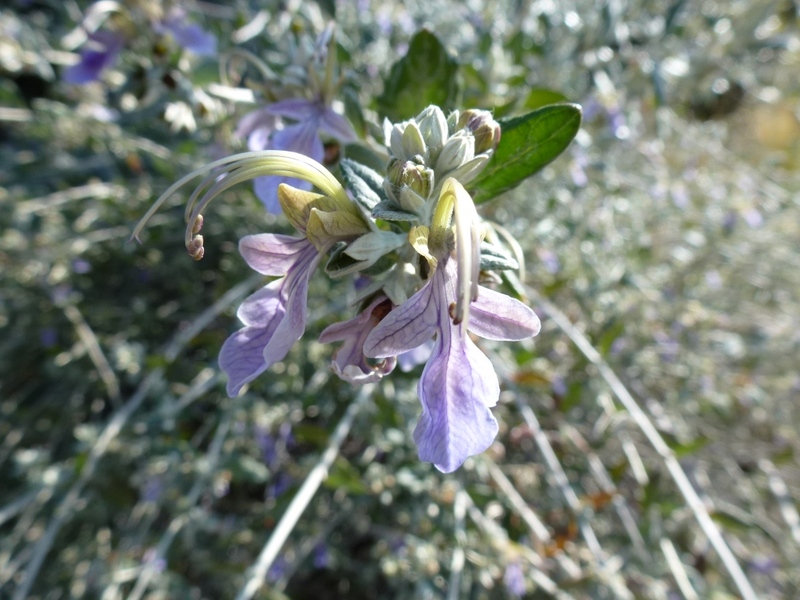 I am fascinated by what triggers plants into growth and flower. I have been visiting the UK and have been enjoying all the daffodils. This is a plant that needs cold weather to trigger flowering; I planted a huge bag of mixed daffodils by the side of the drive a few years ago; the following week we had a lot of rain and I fear many of the bulbs must have rolled down the slope under the loose covering of soil or just turned over. The first year following planting there was a respectable amount of flowers but by no means the number that had been planted, the following year there were less this year at this moment there is one bloom, so not the drifts I dreamed of! After the snow had melted I was surprised at just how many plants where ready to begin to emerge from the soil. Where before the snow there was no evidence of tulip bulbs, now the leaves are pushing strongly up giving me hope of a colourful display to come. 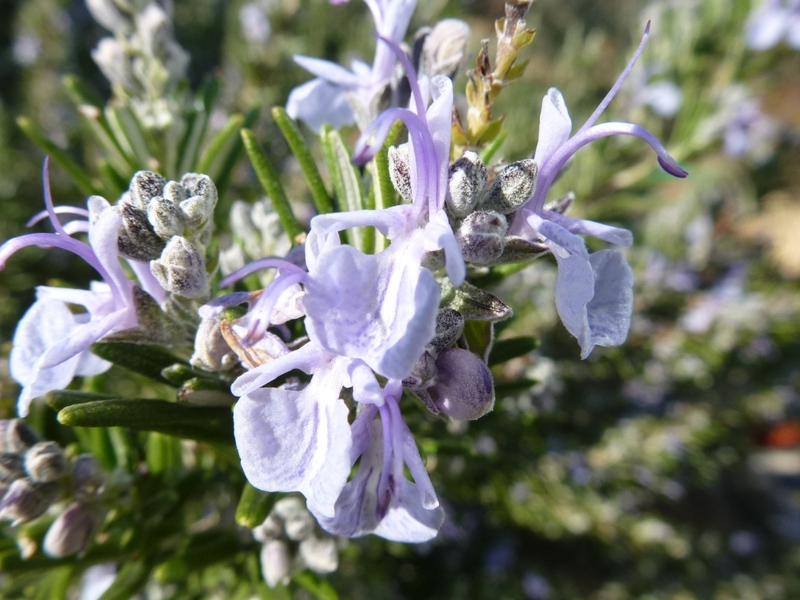 The usual suspects of Rosemary and Teucrium have been flowering for a while, before the snow fell they were already putting on their blue display. 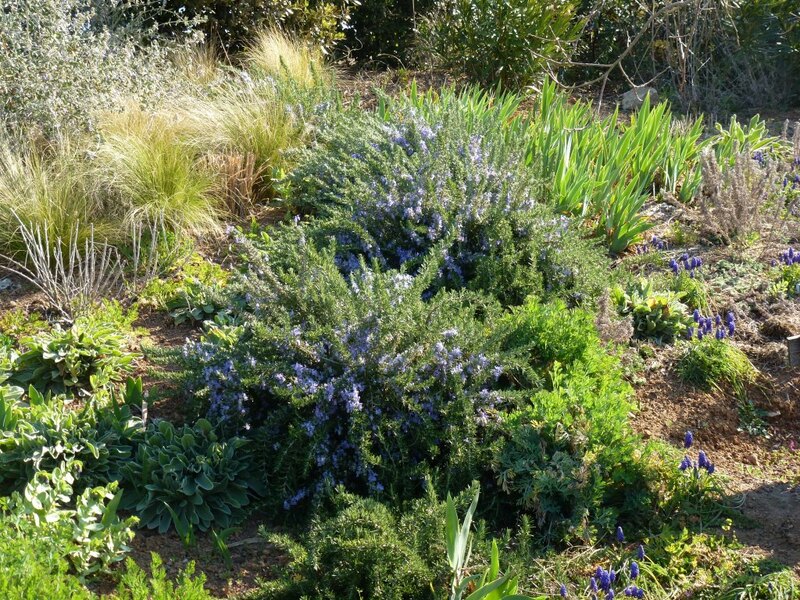 The slope has grown a lot since March last year and the streams of prostrate Rosemary and Muscari are really producing the effect I had hoped for when planning the planting. Viburnum tinus, Cerinthe, Muscari are the obvious stars of the garden this month, early Convolvulus cneorum and a silver-leaved Buddleia have attracted pollinators into the garden that I would have thought would only be attracted by more perfumed flowers at this time of year. 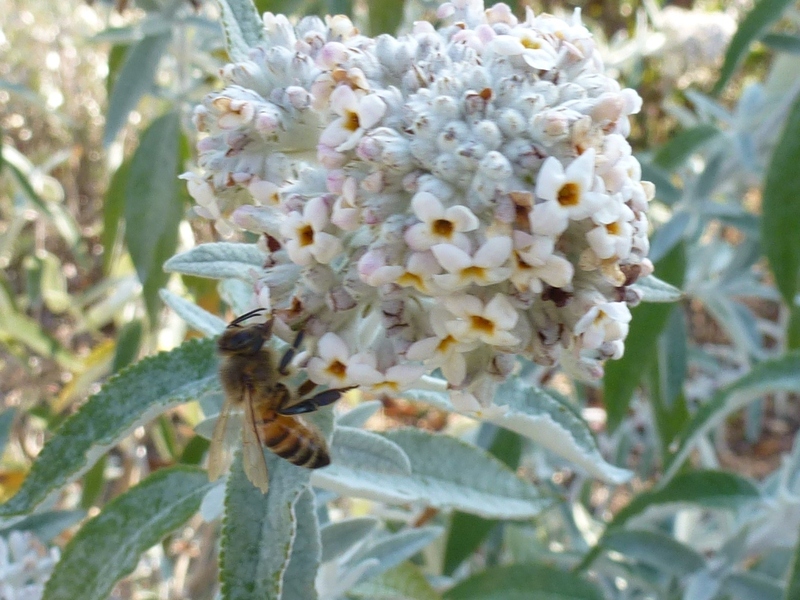 click on the image below to see what’s flowering in My Hesperides Garden in mid-March. A belated thank you to Carol at MayDreams garden for hosting this inspiring meme. 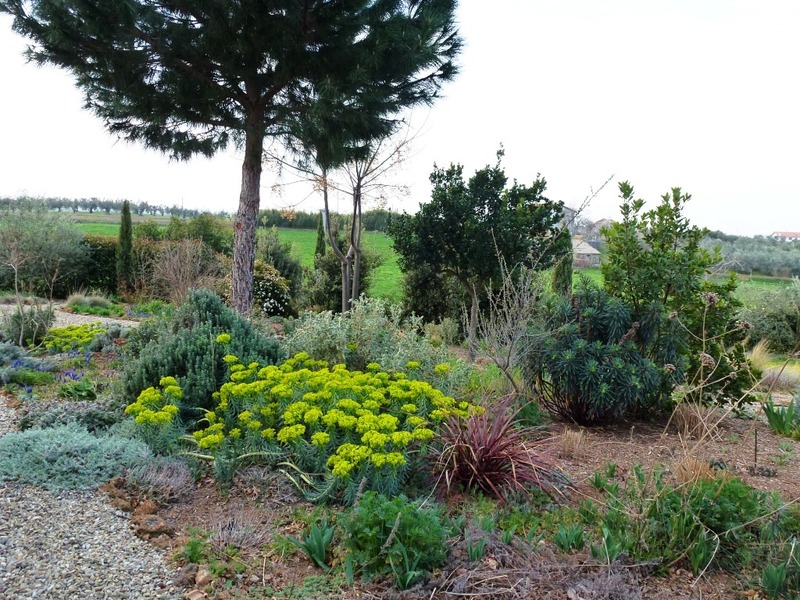 If you haven’t visited yet why not click over to see links to gardens from all over the world. 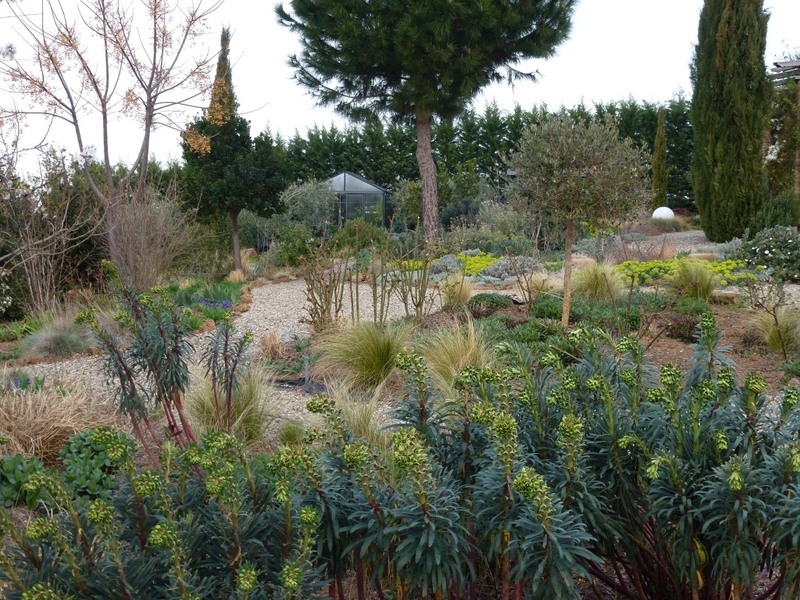 Hopefully you will be able to join me this month for Gardener Bloggers Foliage Day on the 22nd of this month. I’m hoping for some autumn colour from the southern hemisphere.